Jewish Agency for Israel to grant loans to businesses affected by arson attacks and rocket fire originating in the Gaza Strip. The Jewish Agency for Israel will grant loans of up to 100,000 shekels to businesses affected by arson attacks and rocket fire originating in the Gaza Strip. In recent months, terrorists have launched hundreds of kites, balloons and other flying objects set aflame over the Gaza border in order to wreak havoc on the Israeli side. 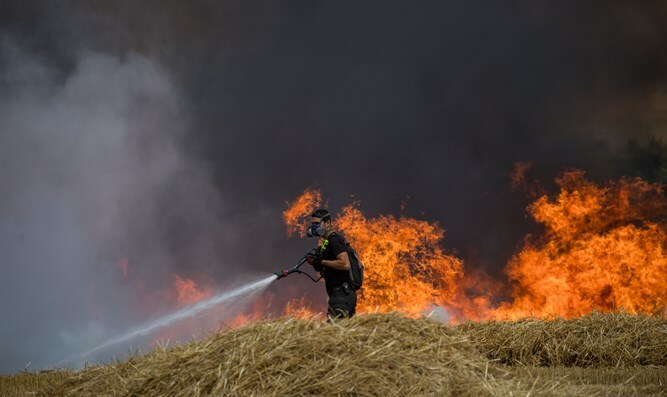 According to Israel Fire and Rescue Services, some 300 fires have erupted in the area surrounding the Gaza Strip since border tensions rose in the spring of this year, affecting more than 60,000 acres. This has caused damage to farms in the area, and also to small businesses in the tourist industry including guest houses, restaurants and pubs. The loans will help small and medium sized businesses near the Gaza border that have suffered under the recent kite arson attacks and rockets launched by Gaza terrorists in recent months. The loans will be granted with expedited processing and preferential terms. The assistance will be provided through The Jewish Agency's Small Business Loan Fund program thanks to a special donation from the Ness Fund, which is supported by the Jewish Community Foundation of Greater MetroWest New Jersey and the Greater Miami Jewish Federation. In response, The Jewish Agency's Small Business Loan Fund program activated the Ness Fund for the Development of the Negev. Jewish Agency assistance will focus on business in the fields of commerce, tourism and services. Agriculture businesses are handled by the Israeli government, as they are defined as victims of hostilities. As part of the emergency plan, loans will be granted to businesses located in the regional councils Hof Ashkelon, Sedot Negev, Shaar Hanegev, Eshkol and Merhavim, as well as the cities of Sderot and Netivot. Amir Sznajderman, Director of the Small Business Loan Funds program at the Jewish Agency, noted that "The Jewish Agency's funds provide quick assistance under preferential terms for businesses, both in routine and emergency situations." Since the program started, The Jewish Agency’s Loan Funds program has helped 1,900 businesses and entrepreneurs, loaning more than 320 million shekels and creating about 9,000 new jobs. "